And then I go home with my heart thudding LIAR! So why am I lying? Because, now that Anthony is in the throes of PDD (Parkinson’s disease dementia), the lie that I am coming back soon, when I am actually going home, is much kinder than wrestling verbally, and emotionally, with him about why I can no longer bring him home. If I say, “I’ll be back soon”, I don’t have to say, “You are too heavy for me to manage at home.” And I don’t have to see his eyes go sad. Instead, he smiles and hugs me and says “Don’t be long, Jules”. Here in Australia we are two days away from spring after a very wet winter. Monday is the first day of spring and I am going to celebrate but I’m not sure how yet. 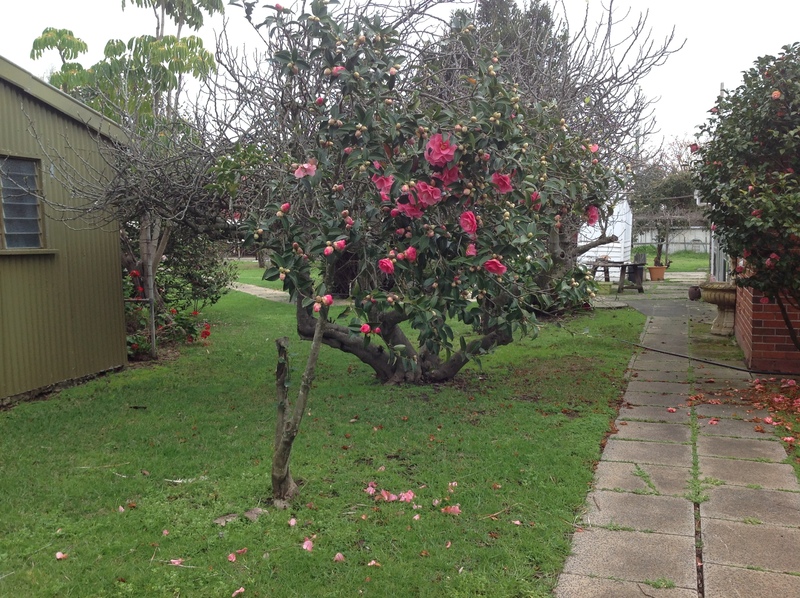 Perhaps I will buy another camellia tree like this one from which I take flowers in to Anthony every second day. 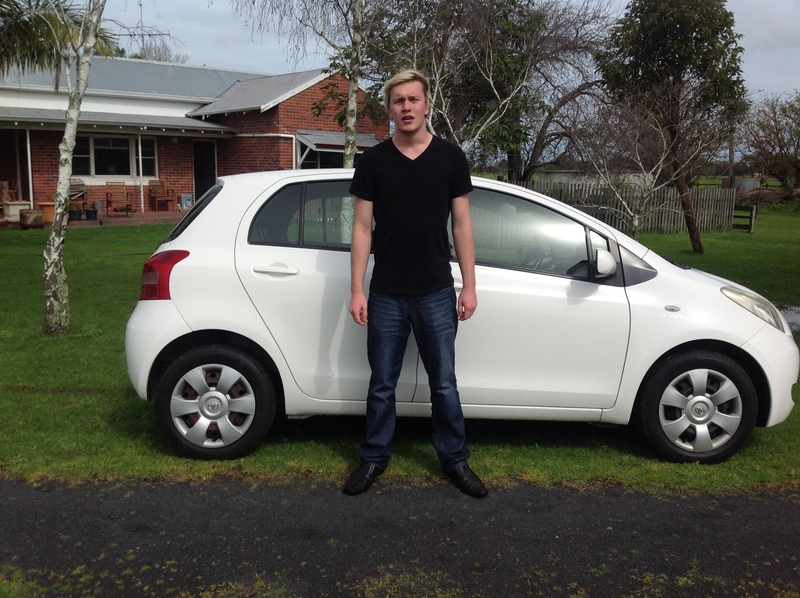 And here is Ming with his little second-hand car, ‘Fran’. He has named her ‘Fran’ after the character in the comedy series Black Books, one of our favourites. As it happens, I am about to take this series into the nursing home to play on Anthony’s new DVD player. I took The IT Crowd in a couple of weeks ago and, even though Anthony slept through some of the two episodes I played, he woke up with a bit of a smile every time I guffawed, which was often. The strange phenomenon in which Anthony sometimes thinks that what is happening on the television screen is happening in his room comes and goes. I only discovered this by accident one evening months ago when I rang him and he asked me to pick him up from Burekup (a nearby town) from an Aboriginal ceremony. At first I thought this was him hallucinating (a Parkinson’s disease symptom) but then I heard the background noise of his television which turned out to be a documentary about an Aboriginal ceremony; I could even hear the chanting! Now that we are watching Midsomer Murders every weekday afternoon from 3.30 – 5pm (another one of Anthony’s favourites, mainly because of the English countryside, the classic cars and the big old houses – not the murders), I sometimes worry that he will get scared. But seeing as this is probably the most benign ever of murder shows, it never happens and anyway he can no longer follow plots. I have gotten into the habit of checking the television guide before I leave every night and leaving the television on a channel that isn’t going to be showing a horror movie, or something like that. Ironically, this is usually the ABC news station. Last week Ming got his driver’s licence back. 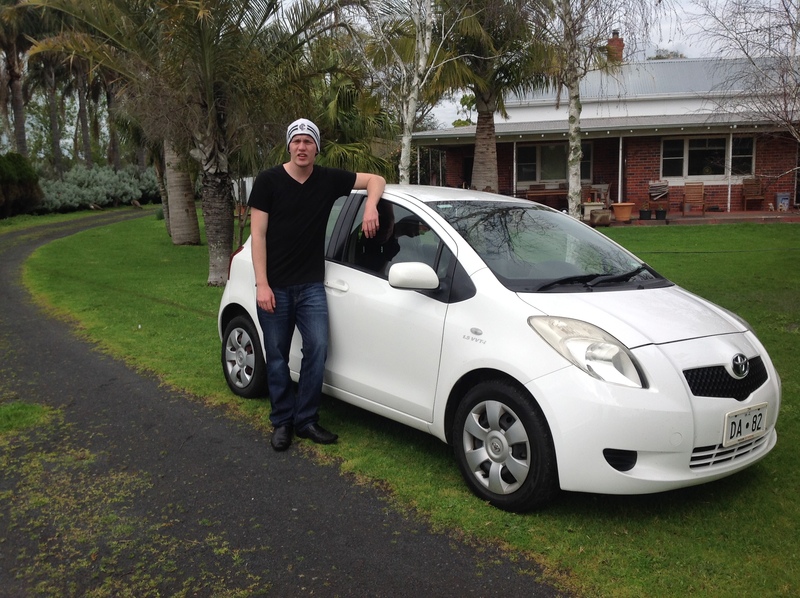 He had to do a written and a practical driving test and the very next day we went up to Perth to collect the little second-hand Toyota Yaris (he has christened it “Fran”) that he had arranged to buy with his savings. Obviously our insurance claim on his ute/truck didn’t pay, but even if it had, Ming never wants another ute again so someone bought it for parts and towed it away earlier in the month. The sight of it out in the back yard, for all of these past months, is not something I will miss although it still has a kind of ghostly presence there, slowly fading. Ming felt there was one last thing he had to do (to move on, I guess) and that was to go back to the site of the accident and remove his P-plate from the tree he’d crashed into. After the accident it had been stuck up high on the tree and we were never sure if the police or insurance people did this to mark the spot for further investigation, or if it was just someone being nasty. In any case, yesterday, Ming took our old ute and a ladder up there and removed the P-plate. He also found bits of debris from the crash so he removed those too and brought them home to be taken to the dump. Having regained his independence, the angry Ming of the last few months seems to have disappeared and the angelic Ming has returned – haha! In a way I guess we have now come full circle in the sense that he was a newly licenced driver when the accident occurred and now he is again a newly licenced driver but with an older head on his shoulders. So that is that. Or is it? Naively, I had thought that once Ming got a car and his independence back, there would somehow be a feeling of closure (for me, I mean), but I relapsed last week into some of the feelings described in the last two posts. The closest I can get to describing this is to liken it to waking up just before a nightmare has come to its conclusion, so you never get to “The End”, and you don’t get that phew of relief that it was only a nightmare. Perhaps the notion of closure is a myth we have invented in order to make things neat and tidy again after a traumatic experience. Perhaps it is living with and beyond the absence of closure that makes people stronger, wiser, even kinder. I don’t know. What I do know, however, is that I have never seen anything as funny as big, tall Ming folding himself into little, tiny “Fran”! I wrote about the accident yesterday, naively thinking that if I regurgitated the stones in my throat, it might be possible to reach a place of calm, cathartic peace. How stupid was that! The dog was here, again, its initial growl sounding like a lullaby until, once I had written my words down, it began to bark madly as if I had done/said something wrong. So I edited what I had written until the dog swallowed my extra words, until it attacked my thumping heart and painted it red with slices of stillness, until it put its big paw against my throat and whined until I woke up. Jet black, this dog blends into the evening sky invisibly, sleeps in the pocket of the dark blankets around my feet at night, wakes me up every morning with the audacity of its sudden absence – not my best friend, not my worst enemy, but my closest companion. Of course I hate the presence of this black dog, and its black eyes, and its black waving tail, and the black fur of its snuggly black snout but recently I have noticed the growing yawn of its absence. Hurray! That dog was blocking out the sun with its big, dark presence, its ridiculous attempt to be a metaphor, its wolfish editorial antics. Beware of the dog. I wrote about the accident yesterday, naively thinking that if I regurgitated the stones in my throat, it might be possible to reach a place of calm, cathartic peace. How wonderful was that! Apparently, despite the fact that we are in Winter here down under in the southwest of Western Australia, the weekend will be sunny. So I have decided to do something new and different and take Ants for a wheelchair walk tomorrow. Not only is this a way of getting him into the sun, it’s a way of me getting some exercise! Also, I am contemplating using my blog to write more regularly again about how a marriage survives the dementia that comes with advanced Parkinson’s disease. Instead of blathering on about this and that, I will focus my blog-writing into a bit of a PDD theme. Since volunteering at the nursing home, I have learned so much and I seem to be in a perpetual state of quiet joy, playing dominoes and cards with various residents, doing the daily walk with dementia residents, rushing in and out of Anthony’s room for quick hugs. The wheelchair walking will be a test of my physical strength (I am very unfit, physically) and, as the nursing home is close to the beach, and hilly, it will also be a test of preventing Anthony from toppling out of the wheelchair when we are going downhill! Okay so, despite the fact that none of the above tasks is, in itself, onerous, it was this kind of list, that rendered me listless. (Interestingly, the word ‘list’ derives from the Middle English word, ‘pleasure’). I would only ever be able to accomplish a few of my listed tasks, I would then feel like a failure…. Eventually, I realized that this kind of list-making was making me extremely unhappy, so much so that I could hardly face each and every day. I resented each and every task I didn’t get done and each and every goal that went by the wayside. Nevertheless, every night I would make another list for the following day. Energized by a pre-midnight spark of incentive, I would make more do-able lists. But with no job to go to, with no Anthony at home to care for, and with Ming out of school, there was rarely anything on my lists that couldn’t wait, so it felt as if I were continually failing myself. As a result, the familiar depression curled itself into a small bundle of rock-hard heartburn that only left me alone when I was asleep. So I slept away many days in June until, on the 29th, I woke up with a new idea; I would write my daily lists differently; I would write them backwards instead of forwards; I would write what I had done every day instead of what I should do. To have done even some of the things I had listed as to-do for weeks (but not done), catapulted me out of my fug and into a fantastically different way of seeing each day. Now, with my listful notebook always handy, I list every single little thing I do on every single day – everything from washing my hair to planting strawberries; everything from poaching eggs to making friends with a new resident at the nursing home; everything from catching up with long-lost relatives to picking camellias for Anthony’s room. This new listful method has also evolved into a better daily routine whereby I am in the nursing home every afternoon, seeing Anthony, doing the volunteering, seeing Anthony again and usually getting home by 6pm. It is so wonderful to NOT be listless! It has taken several weeks to sort out the red tape of me volunteering at Anthony’s nursing home. Okay, let me explain: I will now get paid a small allowance if I do 15 hours of volunteer work per week at a not-for-profit organization. As it happens, Anthony’s nursing home is not-for-profit so last week the Events Coordinator, Ev, showed me the ropes and suggested things like playing cards with Nat, an 83-year-old woman with Parkinson’s Disease and numerous other afflictions, who is in a wheelchair. Then Ev said, “You can always bring Anthony to sit and watch.” My heart did a somersault. Nat: At a loose end are you, love? Me: No! I’ve become a volunteer here and you are my first victim, Nat.